Explanation: Subtle and delicate in appearance, these are filaments of shocked interstellar gas -- part of the expanding blast wave from a violent stellar explosion. 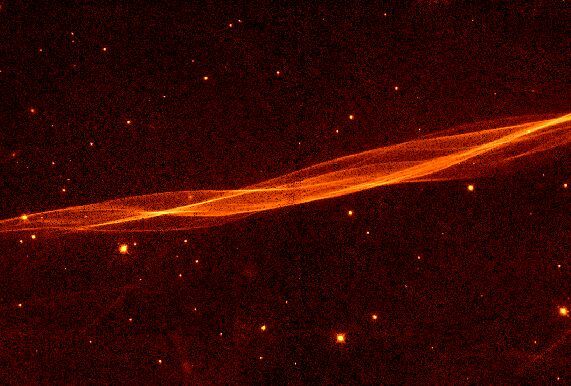 Recorded in November 1997 with the Wide Field and Planetary Camera 2 on board the Hubble Space Telescope, the picture is a closeup of a supernova remnant known as the Cygnus Loop. The nearly edge-on view shows a small portion of the immense shock front moving toward the top of the frame at about 170 kilometers per second while glowing in light emitted by atoms of excited hydrogen gas. Not just another pretty picture, this particular image has provided some dramatic scientific results. In 1999, researchers used it to substantially revise downward widely accepted estimates of distance and age for this classic supernova remnant. Now determined to lie only 1,440 light-years away, the Cygnus Loop is thought to have been expanding for 5 - 10 thousand years.